Sport and recreational facilities are just about 300 m away in the “Joergerbad” with indoor swimming-pool, outdoor pool and sauna. There is also quite near an ice-skating place over the roofs of Vienna in winter and to play soccer in the summer, bowling-allies, indoor golf and a fitness center. A children´s playground is just vis-a-vis from the apartment. 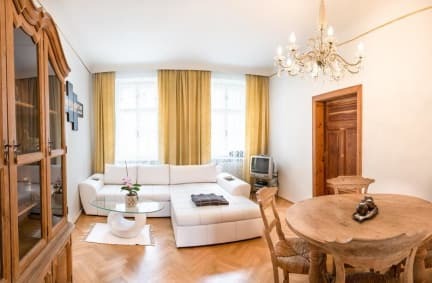 Gabrieles Apartment of ApartmentsInWien is located in easy reach to Vienna's city center via public transport. The apartment is fully furnished with cable TV and DVD as well as washing machine and offers free WiFi. The apartment (60 m²) has a large living-room furnished with a dining-table, a pull-out sofa, cable TV and DVD. The living-room and the bedroom both have parquet flooring. The tiled bathroom has a tub and shower, and a washing-machine. Free WiFi. Two comfortable, bright rooms in a “Gruenderzeit-House” (heritage building), with excellent public transport connections. Payment upon arrival by cash or bank transfer.